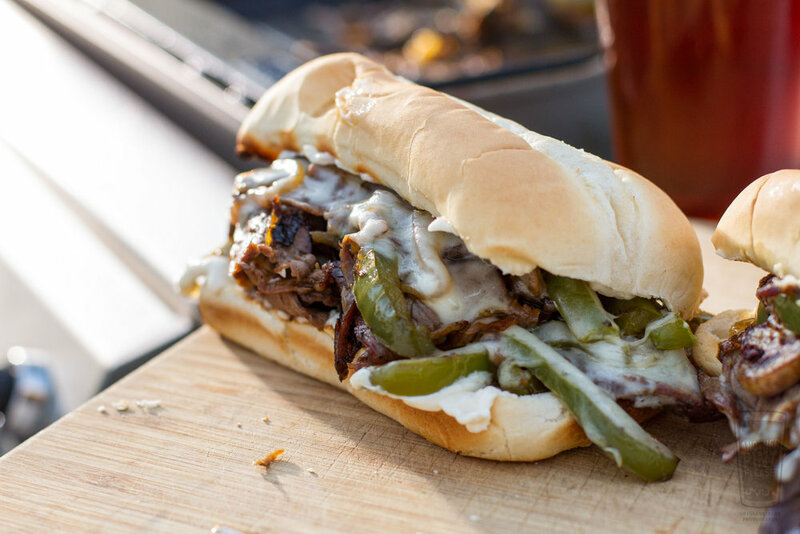 What is there not to love about a cheesesteak? Tender slices of roast beef. Sweet bites of onions, mushrooms, and peppers, and stringy strands of provolone cheese. Throw in the bun, and you pretty much have every food group. They are quite literally, heaven! 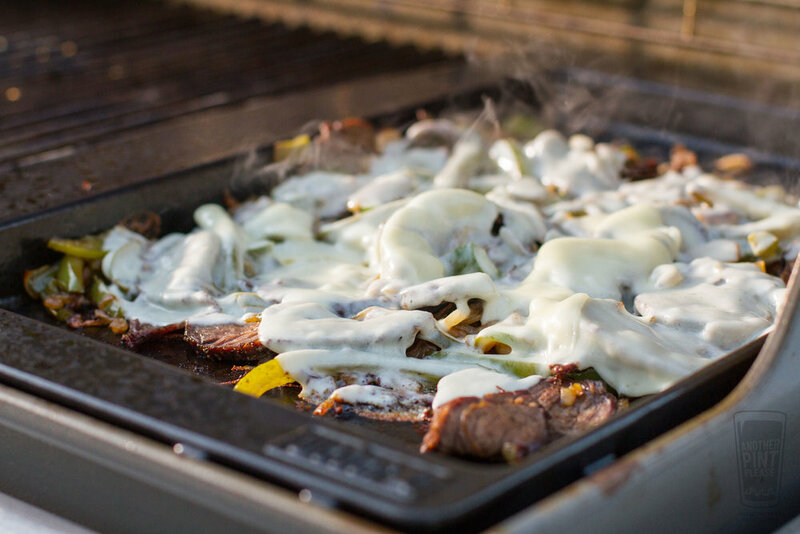 I've made cheesesteaks on the grill, or more specifically, on the plancha, many times before. However, this is the first time I've roasted my meat from scratch, or specifically, rotisseried an eye of round roast for these sandwiches. The results were well worth the effort. Note: To do this right, this is a multi-day recipe. At the most, figure a day to brine, a day to grill and cool the meat, and a day to make the cheesesteaks. The eye of round is a lean cut of beef. To maximize its flavor potential, a dry brine is a must. For added protection, throw in an injection of beef broth. 1. Trim away any excessive pieces of fat. Cover the meat with salt. 2. With a meat injector, inject the beef broth into the meat, moving the needle every inch or so. 3. 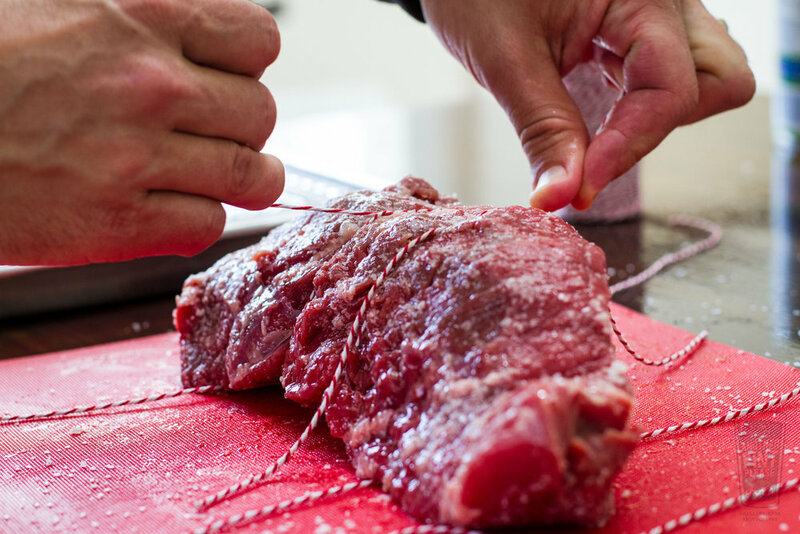 Truss the roast with butcher twine, being sure to "double back" the thin tale of the roast to maintain as even shaped a roast as possible. 4. Place on a wire rack and refrigerate uncovered overnight. 5. The next day, remove the roast from the fridge. Cover in thyme and freshly cracked black pepper. 6. Mount the beef on a rotisserie spit and cook over medium-low heat (250-300°F) or until the internal temperature of the roast equals 120°F with an instant read thermometer. Figure about 45 minutes. On the 4 burner Weber Genesis II LX, I kept the far left and right burners on medium. The center two burners were left off. A drip pan is placed under the roast. 7. With the beef at temperature, remove from the grill. Remove the drip pan and set all of the burners to high. 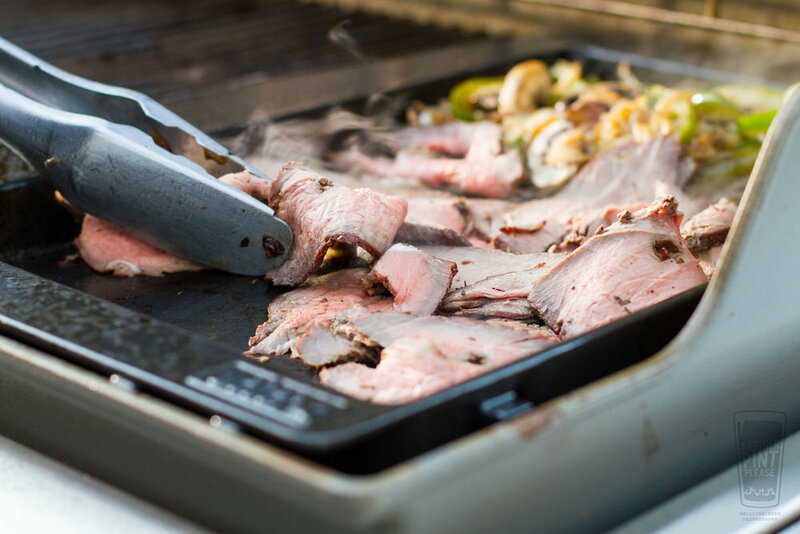 After a 15 minute "reheat," return the beef to the grill. Allow the beef to rotate another 5 minutes. The direct high heat and its searing action makes for a more flavorful crust. 8. Remove the meat from the grill and the meat from the spit. Allow to cool and then refrigerate. Why the chill? Chilled meat is easier to slice thin. It's the difference between trying to slice a block of jello or a block of hard cheese. Overnight chilling is optimal, but a few hours will suffice. It all depends on your timing. 9. Using a griddle, over medium-high heat, melt the butter. 10. Add the onions, peppers, and mushrooms. Season liberally with salt and pepper. Stir occasionally, cooking for 5-10 minutes, or until tender. 11. Add the beef slices to the griddle. Cook another 5 minutes. Stirring occasionally. 12. Grill sliced buns cut side down on the grates over direct heat. Figure about a minute, or until they are well browned. Remove. 13. 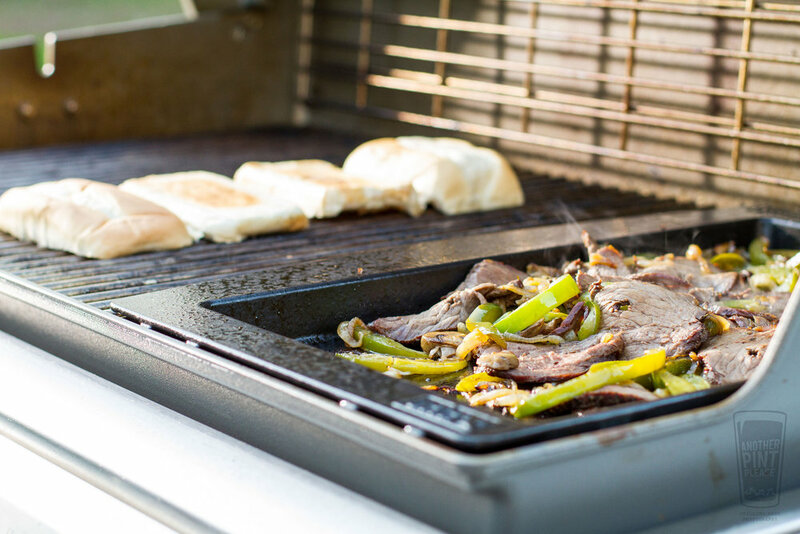 Mix together the beef and vegetable mix on the griddle. Layer the mixture with provolone cheese. Lower the grill lid. 14. Once the cheese has melted, scoop the griddle contents up with a spatula and load onto the grilled buns. I love mayonnaise on my cheesesteaks, but the condiment choice is up to you. I won't judge. There is no doubt the beef requires some effort. However, I find it packed full of more flavor than just grilling up a flat iron or skirt steak without any additional intervention. Besides, grilled cheesesteaks show just one more use for the grill and a griddle: sandwich maker. Note: The Weber Genesis II LX is part of ongoing work I have for Weber. This post is just me making dinner. Opinions are my own.